I spent last Friday evening at Nana checking out their Friday Night Flight promotion. Nana is one of my favorite restaurant/bars in Dallas. Not just because they have amazing food and I adore General Manager, Mark LaRocca, but because they have the BEST view of the Dallas skyline. At night, it is a spectacular setting. Nana’s popular Friday Night Flight is baaaaaack! Enjoy a delicious trio of food and wine samplings for only $20 (excluding tax and gratuity). That's right TWENTY DOLLARS! It is a steal of a deal. Created by Executive Chef Anthony Bombaci and Wine Steward Russell Burkett, I was lucky enough to enjoy the March flight, which featured three Californian wines expertly paired with Lemonized Langostine Ceviche, Wild Mushroom Risotto and Gorgonzola with Walnuts, Cassis and Licorice. 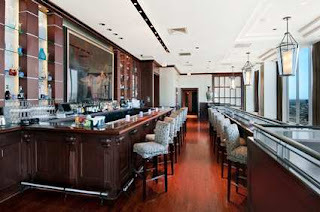 Reservations are highly recommended by calling 214.761.7470 or visit www.nanarestaurant.com for complete details.